Q. Is there a key item a resume must have in order for a job candidate to advance to the interview stage of the hiring process? Resumes should follow the old copywriting rule of claim, proof, and benefit. 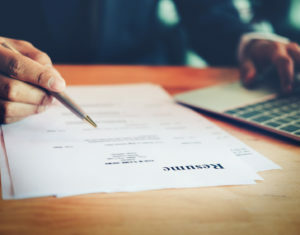 When a resume makes a claim and backs it up with proof, then this will have the strongest impact on whether the person can move ahead to the interview stage. When providing proof, a resume should offer specific results, and then explain the benefits of those results. Hiring managers primarily look for one thing on resumes: relevance. This includes experience that is relevant to the job description and special skills that are relevant to the preferred qualifications. A candidate whose resume is clear, concise, and draws these direct parallels will always make the short list and be invited to interview. You need long-term team members who can learn about your company and help push growth forward while moving up in the company. You want to know they've spent time and effort in their previous workplace. A lot of resumes come from people who have made no effort to customise their resume for the position. They include irrelevant details, they don’t respond to requirements that are in the job post, and they show no evidence of research. Generic “tech” resumes that the applicant has sent to dozens of businesses don’t impress. You need to see tight, concise resumes that show an understanding of what the role entails. A candidate with strong potential will study our website and incorporate our core values somewhere in their resume or cover letter. Even if a potential employee doesn’t directly address the values, we look for words and indications that show an alignment to our values, such as proactiveness or positivity. If a job candidate is willing to put high-level references down, that tells me they worked hard at their previous job and are proud to have others speak on their behalf. If what I see is a collection of references from 10 years ago, red flags go up. As the most important document to represent yourself and your career path, your resume needs to be perfect. Nothing detracts quicker from your resume’s first impression than poor grammar and spelling. Not only does it not reflect well on you, but it also may be an indicator that you are unwilling to ask for help from friends and family, which could reflect future behaviors in the team environment. Even if a candidate has relevant experience, there are a blinding myriad of CVs to review. The keywords we look for are sometimes hidden in resume formats that do not help highlight experience. We’re looking for relevance or a quality in the candidate that convinces us they can complete the work. A hiring team can quickly assess a candidate’s ability to succeed in your company by analyzing their use of data in their resume. Look for individuals who can quantify their accomplishments. This helps to get a sense of the tangible impact they have had on other organizations, giving insight into how much real value they may be able to bring to your business. The only real information you need to get from a resume is an overview of how well an applicant reads a listing and follows the instructions therein. Ask for something specific, just to gauge the applicant’s responsiveness, but then immediately move on to their portfolio. When evaluating resumes, you should look for growth. Has this candidate grown from job to job? Has their position escalated in each job location? If not, then they were seemingly treading water, which is not what you want. You want people who are hungry. The resumes that stand out do something different. They don’t just focus on education and experience—they give an idea of who the person really is. Completed a marathon? It shows a level of commitment; you worked full-time while earning your degree? Powerful—it shows that you have a strong work ethic. Share what you normally wouldn’t put on a resume. That way you’ll be memorable.